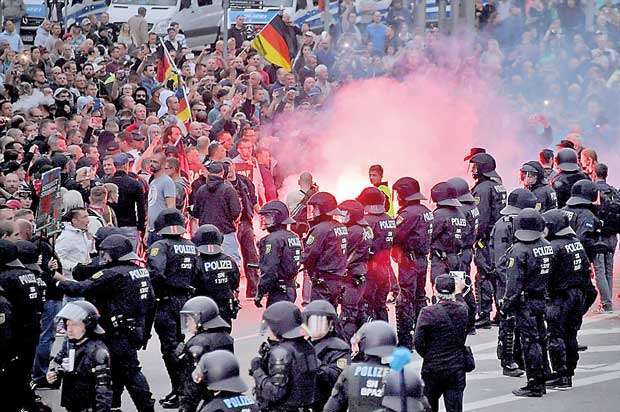 DPA, 28th AUGUST, 2018- Police in the eastern German state of Saxony came under fire on Tuesday for failing to contain rival far-right and left-wing protests the night before that culminated in violent clashes. The death of a 35-year-old German man - allegedly at the hands of two asylum seekers from Iraq and Syria - in the early hours of Sunday sparked two days of protests that were partially fuelled by the false claim the victim had intervened to protect a woman. Police later denied this claim, which had been disseminated by right-wing groups on social media, saying only that the man had been involved in a verbal altercation with the two suspects, who have since been remanded in custody. The protest on Monday drew some 5,000 far-right demonstrators and around 1,000 counterdemonstrators. Six people were injured. A police spokesman later admitted that the deployment of officers to Chemnitz had not been large enough to separate the camps. Oliver Malchow, head of police union GdP, told German newspaper Neue Osnabruecker Zeitung that thousands of police staff cuts in recent years were responsible for the lack of control over right-wing violence.